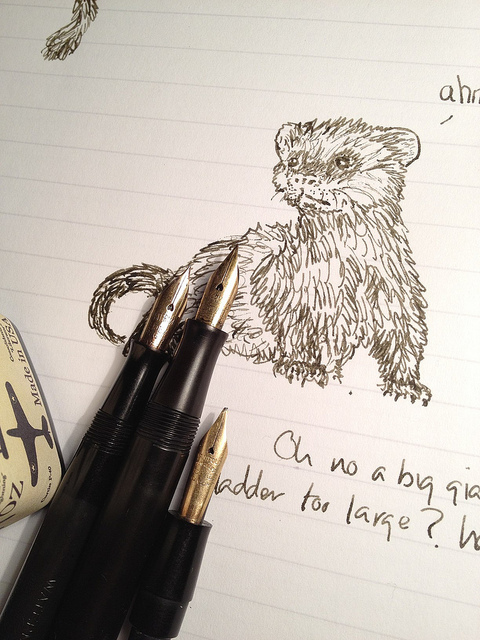 Personally, I think brown is a perfectly respectable ink colour, and more importantly, it is an awesome colour for sketching..
A perfect time to try out my newly enbladderated vintage Waterman lever fill I obtained in a job lot on the ebat. I managed to remove the old ossified bladder without too much incident and replaced it with a new one from www.penmuseum.co.uk. 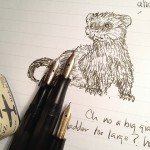 Luckily, I did not yet shellac in the new bladder, as it splurted a big blob on my ferret’s foot as I was doodling him (I think this might be because the bladder was too near the pen walls, and was warmed by my hand – I could be entirely wrong..). I might try diluting it slightly, to see if I can get some better colour graduation – and it does seem a little prone to clogging slightly if I am using light strokes. I also have the Noodler’s bulletproof black – the main point behind these two ink purchases is their relative water resistance, for ink and wash painting. Dip pen ink contains shellac, which is death to fountain pens, hence permanence in fountain pen ink is not by standard, very good. Next: Pen, ink and wash!